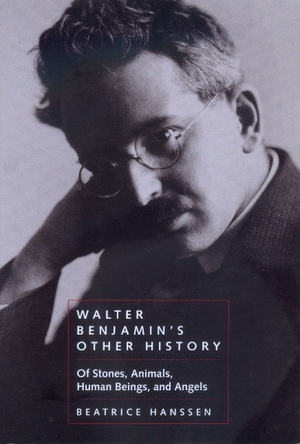 Many of the critical and philosophical writings of Walter Benjamin's so-called metaphysical pre-Marxist period, as well as the products of his turn to historical materialism, deserve to be reinterpreted in light of an aspect of his philosophy of history that has been largely ignored: his call for a kind of history that is not anchored exclusively in the experience and conerns of human beings. In The Origin of German Tragic Drama, Benjamin develops this original conception of a non-anthropocentric history, coupling it with a critique of the philosophy of the subject that would culminate in his redefinition of the theological concept Kreatur. This essay begins its exploration of Benjamin's "other history" by linking him to two philosophical contemporaries, Theodor Adorno and Martin Heidegger. It revisits the intense intellectual relationship between Benjamin and Adorno, one that towards the end was fraught with disagreement and conflict. It examines Heidegger's thought as the negative foil against which the singularity of Benjamin's thought can be brought into better relief, not despite but precisely because of their common project of overcoming the shortfalls of humanism. The essay then considers the extent to which Benjamin's development of a new historiography was bound up with a reappraisal of the subject of idealism. It examines Benjamin's de-limitation of the human subject by focusing on the figures of stones, animals, and angels that are scattered throughout his writings. Often his concern with these images was shaped by questions about ethics, the law, and justice, which form a sometimes tacit subtext throughout his work. Above all in his redefinition of the theological term Kreatur, Benjamin probed the limits of Kantian ethics and humanism. To be sure, the critique of humanism has garnered much attention in recent years, especially in the political controversies surrounding French theory and philosophy. It has been taken to task for eliminating the normative and, with it, the foundations upon which ethico-political action rests. Hanssen's analysis of Benjamin's position expands the stakes of this debate by uncovering the ethico-theological side of his thought. In its turn to the ethico-theological, this essay does not intend to position Benjamin as an anti-modernist or diminish his position as an archeologist of the modern. But it does mean to call attention to the fact that even in the thirties Benjamin failed to offer a blueprint for the Marxist revolution, but returned incessantly to that which effectively precedes the political realm: the ethico-theological. At a far remove from Aristotelian or Kantian ethics, Benjamin repeatedly invoked a divine justness, imaged by the just man (der Gerechte). In so doing, he failed to suggest a link between the ethical and the political, or to show how an attentiveness for the creaturely was to be negotiated with a political model anchored in human agency. This incongruency in his thought is allegorized by an uncanny figure who heads off the theses on history and reflects on the limits of the human: it is the dwarf of theology hidden in the chess-playing automaton of historical materialism. Long considered to be an impenetrable, hermetic treatise, Walter Benjamin's The Origin of German Tragic Drama has rarely received the attention it deserves as a key text, central to a full understanding of his work. In this critically acclaimed study, distinguished Benjamin scholar Beatrice Hanssen unlocks the philosophical and ethical dimensions of his thought with great clarity and sophisitication. Beatrice Hanssen was trained in Comparative Literature at Johns Hopkins University and is Associate Professor of German at Harvard University. She is the author of Critique of Violence: Between Poststructuralism and Critical Theory, an editor of The Turn to Ethics, and co-editor of the series Walter Benjamin Studies.